Alaska is one step away from enacting a law that would legalize the regulation and production of industrial hemp, and provide for hemp pilot programs. 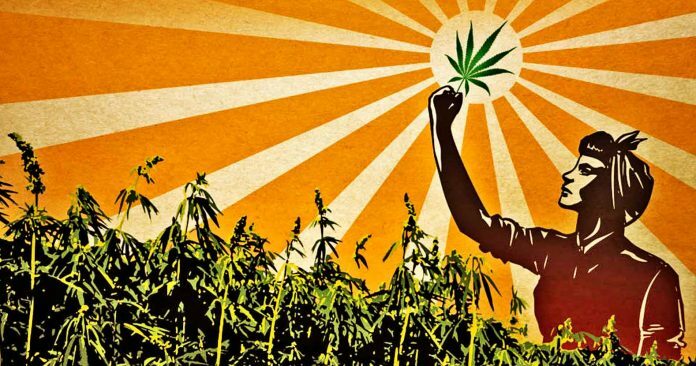 Alaska is one step away from becoming the latest state to fight back against the federal government’s “War on Nature” after a bill to legalize the production of industrial hemp passed the state House and Senate and is now awaiting the governor’s approval. Residents are hopeful that Gov. Bill Walker will sign Senate Bill 6 into law, which would legalize the regulation and production of industrial hemp, and provide for hemp pilot programs. It would also separate hemp from the definition of “marijuana,” and clarify the fact that adding industrial hemp to food does not create an adulterated food product. A businesswoman seeking to grow hemp to supplement livestock feed and to use in natural body balms and salves, Ember Haynes, said she is hopeful for the new legislation because it would allow her to stay local instead of having to outsource the products she needs. Alaska Cannabis Exchange Owner Aaron Ralph told KTUU News that he is hopeful he will have the opportunity to legally bring his hemp business in Colorado to Alaska. “Being able to grow hemp with 50,000 different uses for hemp it is a no-brainer that we can utilize what we are growing here in some form or facet to help benefit Alaska and it’s economy,” he said. As The Free Thought Project reported, the state of Nevada passed a new law in June that authorized the cultivation of industrial hemp for commercial purposes and the production of agricultural hemp seed. The legislation also acknowledged the role of hemp in aiding the state’s flourishing cannabis industry. Cannabis for recreational use became legal in Alaska in 2015, and it is one of several states pushing to legalize further research on the production of industrial hemp. In 2017, at least 15 states—Arkansas, Colorado, Florida, Hawaii, North Dakota, Nevada, New York, Oregon, South Carolina, Tennessee, Virginia, Washington, West Virginia, Wisconsin, and Wyoming—passed legislation establishing new licensing requirements and programs for hemp.